LIFE GETS ESPECIALLY BUSY this time of year in rural Minnesota as farmers gear up for harvest. They’re readying their equipment, preparing to move into the ripening corn and soybean fields. Some have already been out chopping corn. As the days progress swiftly toward winter, farm work too moves at an often frantic pace with long days behind the wheel of a combine or a tractor or a truck. With those increased work hours come fatigue and the very real danger that one slip, one wrong move, could endanger a farmer’s life. That’s why I’m glad to see projects like the Farm Fatigue Program, a collaboration of the Hutchinson and Glencoe Chamber of Commerce ag business committees. The two groups have teamed up to deliver donated items—like safety glasses, ear plugs, sun screen, apples, water and candy—to farmers laboring in the fields. Members also deliver a message of thanks and a reminder to stay safe, according to the Hutchinson Area Chamber of Commerce Convention and Visitors Bureau. In the past two years the Hutch and Glencoe committee members have distributed 300 bags to farmers while patrolling the back roads and highways of McLeod County for several days during peak harvest. When the orange-sweatshirt-clad delivery men and women spot a farmer working the fields, they stop. The Hutchinson group offered the program for eight years before partnering with Glencoe. Bishop Jon Anderson of the Evangelical Lutheran Church in America Southwestern Minnesota Synod and Trinity’s pastor, the Rev. William Nelsen, will bless attending farm families. But the congregation is thinking beyond local farmers and their safety. Proceeds from an after-dinner service will benefit farmers in South Africa, where members of Trinity and its sister congregation, St. Paul’s, recently traveled. I’m impressed with the strides that the Gaylord, Hutchinson and Glencoe groups are taking to thank farmers and promote safety. For me, farm safety is personal. While growing up on a southwestern Minnesota dairy and crop farm in the 1960s and 1970s, I was always aware of the dangers inherent to farming. My bachelor uncle Mike, who was like a second father to me, lost the tips of several fingers in a wagon hoist accident. Another distant relative lost an arm. 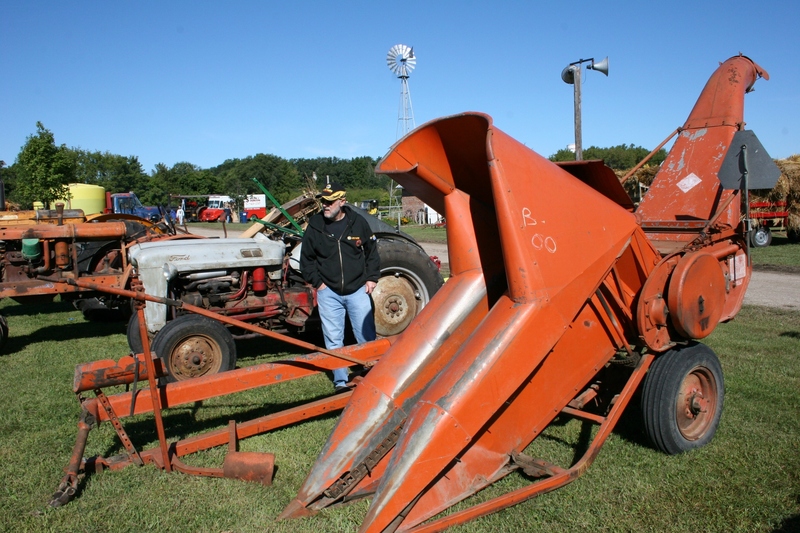 An Allis Chalmers corn chopper, like this one recently exhibited at the Rice County Steam & Gas Engines Show, claimed my father-in-law's left hand and much of his arm in a 1967 accident. That's my husband, Randy, who saved his dad's life by running for help. Randy remembers the accident just like it happened yesterday. Randy showed me the spring-loaded corn chopper roller, where his dad's hand was pulled in and trapped. My father-in-law lost his left hand and much of his arm in that farm accident. For years he sported a hook arm, but today wears a prosthetic hand and arm. He’s adjusted well. He had no choice. 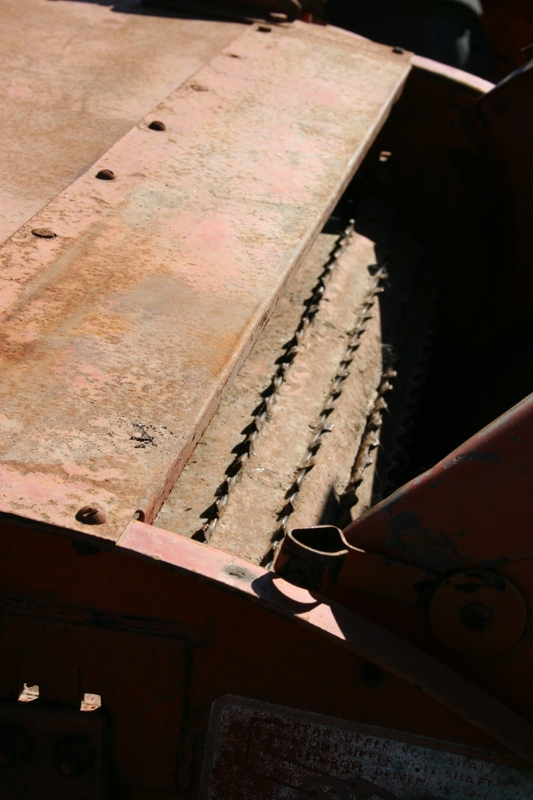 Thankfully, farm equipment today is much safer than the farm equipment from decades ago. 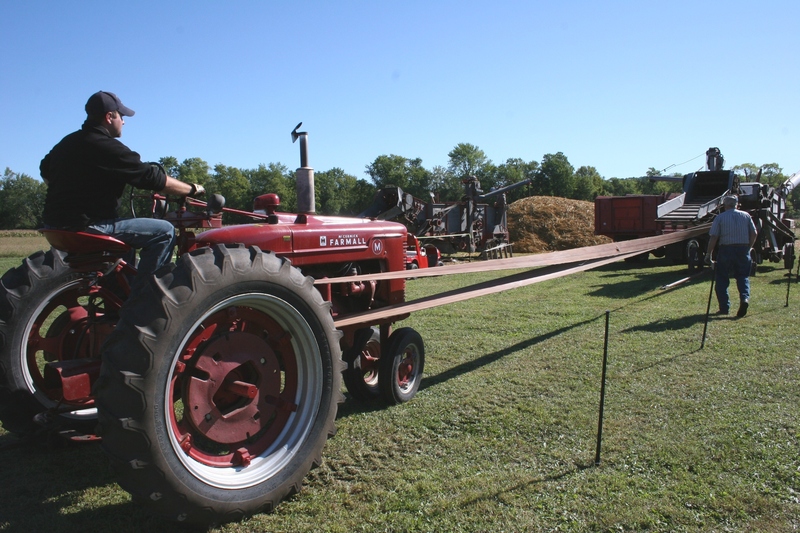 Just look at the dangers farmers faced as shown in this threshing demonstration at the recent Rice County Steam & Gas Engines Show. Thankfully items like exposed belts are mostly an issue of the past. Yet, fatigue, haste or a lack of caution can still cause a tragedy in the field, on the farm or even along a country road or highway. So when I hear about projects like the Farm Fatigue Program or the Tractor Roll-In and Harvest Blessing Service, I’m especially thankful. Farmers, please be safe this harvest season. IF YOU KNOW of any other community farm safety programs here in Minnesota, please share the information in a comment. We all need to work together to keep farmers safe during harvest, and year-round.